The Third Picture commemorates the visit of Dsilyi‘ Neyáni to Çaçò‘-behogan, or “Lodge of Dew”. To indicate the great height of the Bitsès-ninéz the figures are twice the length of any in the other pictures, except the rainbows, and each is clothed in four garments, one above the other, for no one garment, they say, can be made long enough to cover such giant forms. Their heads all point to the east, instead of pointing in different directions, as in the other pictures. 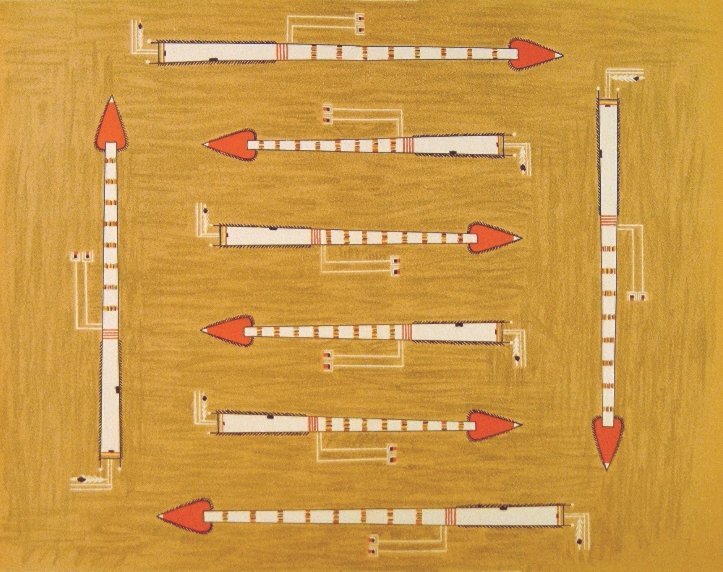 The Navajo relate, as already told, that this is in obedience to a divine mandate; but probably there is a more practical reason, which is this: if they had the cruciform arrangement there would not be room on, the floor of the lodge for the figures and at the same time for the shaman, assistants, and spectators. Economy of space is essential; but, although drawn nearly parallel to one another, the proper order of the cardinal points is not lost sight of. The form immediately north of the center of the picture is done first, in white, and represents the east. That immediately next to it on the south comes second in order, is painted in blue, and represents the south. The one next below that is in yellow, and depicts the goddess who stood in the west of the House of Dew-Drops. The figure in the extreme north is drawn last of all, in black, and belongs to the north. As I have stated before, these bodies are first made naked and afterwards clothed. The exposed chests, arms, and thighs display the colors of which the entire bodies were originally composed. The glòï (weasel, Putorius) is sacred to these goddesses. Two of these creatures are shown in the east, guarding the entrance to the lodge. The appendages at the sides of the heads of the goddesses represent the glòï-bitcà, or headdresses of glòï skins of different colors which these mythic personages are said to wear. Each one bears attached to her right hand a rattle and a charm, or plume stick, such as the gods in the second picture carry; but, instead of the basket shown before, we see a conventionalized representation of a branch of choke cherry in blossom; this consists of five diverging stems in blue, five roots, and five cruciform blossoms in white. The choke cherry is a sacred tree, a mountain plant; its wood is used in making certain sacrificial plume sticks and certain implements of the dance; it is often mentioned in the songs of this particular rite. Some other adjuncts of this pictureâ€”the red robes embroidered with sunbeams, the arms and legs clothed with clouds and lightning, the pendants from the arms, the blue and red armlets, bracelets, and gartersâ€”have already been described when speaking of the second picture. The object in the left hand is a wand of spruce. 173. The rainbow which incloses the picture on three sides is not the anthropomorphic rainbow. It has no head, neck, arms, or lower extremities. Five white eagle plumes adorn its southeastern extremity. Five tail plumes of some blue bird decorate the bend in the southwest. 451 The plumes of the red shafted flicker (Colaptes auratus var. mexicanus) are near the bend in the northwest and the tail of the magpie terminates the northeastern extremity. Throughout the myth, it will be remembered, not only is the House of Dew-Drops spoken of as adorned with hangings and festoons of rainbows, but many of the holy dwellings are thus embellished.and blue the female. The Second Picture is said to be a representation of the painting, which the prophet saw in the home of the bears in the Carrizo Mountains . In the center of this figure is the bowl of water covered with black powder, to which I referred before. The edge of the bowl is adorned with sunbeams, and external to it are the four caacbitlol, or sunbeam rafts, on which seem to stand four Gods, or Yays. The divine forms are shaped alike but colored differently. They lie with heads extended outward, one to each of the four cardinal points of the compass, the faces looking forward, the arms half extended on either side, with the hands raised to a level with the shoulders. They wear around their loins skirts of red sunlight, adorned with sunbeams. They have ear pendants, bracelets, and armlets, blue and red (of turquoise and coral), the prehistoric and emblematic jewels of the Navajo. Their forearms and legs are black, showing in each a zigzag mark to represent lightning on the surface of the black rain clouds. In the north god these colors are, for artistic reasons, reversed. Each bears, attached to his right hand with a string, a rattle, a charm, and a basket. 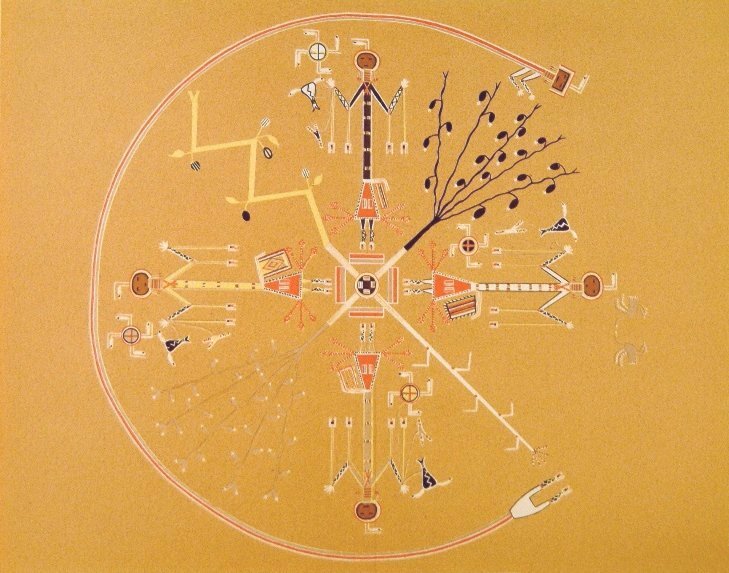 The rattle is of the shape of those used by the medicine men in this particular dance, made of raw hide and painted to symbolize the rain cloud and lightning. The left hand is empty; but beside each one is a highly conventionalized picture of a plant. The left hand remains empty, as it were, to grasp this plant, to indicate that the plant at the left hand belongs to the god whose corresponding hand is unoccupied and extended towards it. The proprietorship of each god in his own particular plant is further indicated by making the plant the same color as the god. The body of the eastern god is white; so is the stalk of corn at his left, in the southeast. The body of the southern god is blue; so is the beanstalk beside him, in the southwest. The body of the western god is yellow; so is his pumpkin vine, in the northwest. The body of the north god is black; so is the tobacco plant, which is under his special protection, in the northeast. Each of the four sacred plants is represented as growing from five white roots in the central waters and spreading outwards to the periphery of the picture. The gods form one cross whose limbs are directed to the four cardinal points; the plants form another cross having a common center with the first named cross, but whose limbs extend to the intermediate points of the compass. On the head of each yay is an eagle plume lying horizontally and pointing to the right. A similar arrangement of four plumes, all pointing in one direction (contrary to the sunâcs apparent course), may be observed on the baskets carried by the gods. The gods are represented with beautiful embroidered pouches, each of a different pattern. 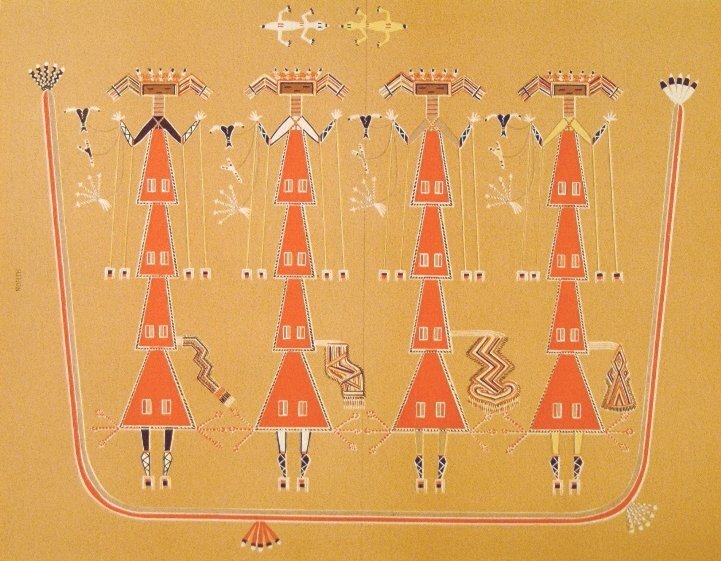 In old days the most beautiful things in art the Navajo knew of were the porcupine quill embroideries of the northern races. The art of garnishing with quills, and later with beads, seems never to have been practiced to any extent by the Navajo women. 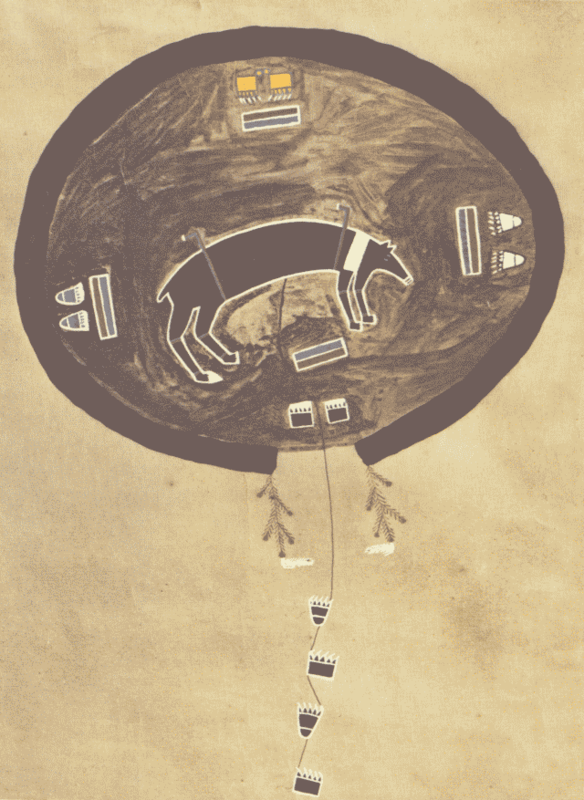 They obtained embroideries of the Ute and other northern tribes, and their ancient legends abound in allusions to the great esteem in which they held them. Surrounding the picture on about three-fourths of its circumference is the anthropomorphic rainbow or rainbow deity. It consists of two long stripes, each about two inches wide in the original picture, one of blue, one of red, bordered and separated by narrow lines of white. At the southeastern end of the bow is a representation of the body below the waist, such as the other gods have, consisting of pouch, skirt, legs, and feet. At the northeastern end we have head, neck, and arms. The head of the rainbow is rectangular, while the heads of the other forms in this picture are round. In the pictures of the Yiabichy dance we frequently observe the same difference in the heads. Some are rectangular, some are round; the former are females, the latter males; and whenever any of these gods are represented, by characters, in a dance, those who enact the females wear square stiff masks, like our dominoes, while those who enact the males wear roundish, baglike masks, of soft skin, that completely envelop the head. The rainbow god in all these pictures wears the rectangular mask. Iris, therefore, is with the Navajo as well as with the Greeks a goddess. All the other gods bear something in their hands, while the hands of the rainbow are empty. This is not without intention. When the person for whose benefit the rites are performed is brought in to be prayed and sung over, the sacred potion is brewed in a bowl, which is placed on the outstretched hands of the rainbow while the ceremony is in progress and only taken from these hands when the draught is to be administered. Therefore the hands are disengaged, that they may hold the gourd and its contents when the time comes. In the east, where the picture is not inclosed by the rainbow, we see the forms of two birds standing with wings outstretched, facing one another, their beaks close together. These represent certain birds of blue plumage called by the Navajo Ã§Ã²li (Sialia arctica). This bluebird is of the color of the south and of the upper regions. He is the herald of the morning. His call of â€œÃ§Ã²li Ã§Ã²liâ€ is the first that is heard when the gray dawn approaches. Therefore is he sacred, and his feathers form a component part of nearly all the plume sticks used in the worship of this people. Two bluebirds, it is said, stand guard at the door of the house wherein these gods dwell; hence they are represented in the east of the picture.